Speaking of cool camera apps, Nokia has also pre-installed StoryTeller on the Lumia 1520, which organizes your photos and videos into collections based on the location and time they were shot (note: the app is still in Beta). Duplicates are automatically hidden, but not deleted if you want to go back and pick a better shot of the scene. If you zoom out of a photo, you'll see where it was taken and what's nearby. 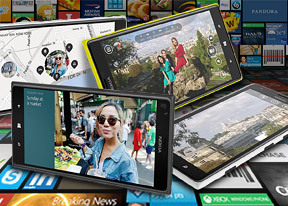 Being a high-end Lumia smartphone, the 1520 gets the Drive+ navigation suite for free out of box. Unlike Drive available on lower-end Lumias, Drive+ has global coverage. And since it's available offline you don't have to worry about roaming data charges, either. Drive+ uses big, clear instructions on its screen in addition to the voice prompts, which is ideal for in-car use. You can switch between 2D and 3D mode and chose the color scheme (day, night, auto). There are speed alerts and real-time traffic information. We do miss a few options however - like setting a starting point other than your current location and downloading maps for an entire continent. Still, Nokia offer quality maps and offline voice-guided navigation out of the box, which puts them ahead of other Windows Phone makers and even other platforms (the stock mapping apps on Android and iOS require a data connection to plan the route). The most recent update to the HERE suite adds an overview of traffic conditions in your area, including your drive to and from work with the My Commute app. My Commute shows an at-a-glance look of your journey with a special Live Tile on your homescreen. You can setup up multiple commutes as well. Nokia Music is the company's custom app, which combines a music store and a streaming service called Mix Radio. Lumia owners get the streaming service for free (works right out of the box) and it boasts an extensive library of tracks. While it is mostly streaming oriented, you can make tracks available offline in Mix Radio to reduce data usage (they remain on the device only temporarily though). Note that the paid Music+ service offers higher-quality audio. But Mix Radio is competing with services like Pandora too - you can give it a list of artists you like and it will automatically build a playlist to your taste. Nokia takes pride in real people creating the mixes (including celebrity-made mixes) instead of computer algorithms. Unlike competing services, you can also browse a specific artist and even buy songs to keep if you like. There are plenty of charts (e.g. Top sellers, Best of 2013, Songs for Fall) if you're looking for something new too. Nokia's app has a few other advantages - it has several equalizer presets (including a custom one) and Dolby Headphones enhancements. Also, if you like an artist, the app will help you look for gigs close to you. Then there's Zinio, which isn't made by Nokia but is exclusive to Lumia devices on Windows Phone. Zinio creates a reading list based on your interests and you can set it to download them for offline reading (only over Wi-Fi). Zinio is also a shop for digital magazines - you can buy single issues or subscribe for 12 issues.